I know I've mentioned before that Muse is probably the best band I've ever seen live. They engage the audience with such a high level of energy that one cannot help but be drawn in deeper. 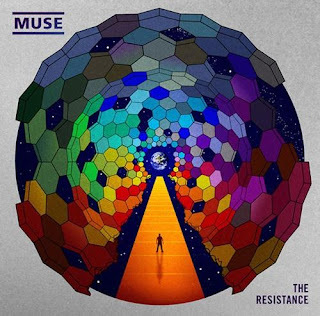 In just over a month Muse will release their new album "The Resistance." If you've managed to avoid them through four studio albums, a B-side album, and two live albums, then it's time for you stop resisting [my bad on the pun.] Here is a LINK TO THE FIRST SINGLE OFF THE NEW ALBUM. I highly recommend checking it out. 10. Sunburn - I remember the first time I ever heard this song. It was included in a free mix CD that came with Q magazine. I picked it up because a) I recognized some of the other bands on the CD and b) I worked at Tower Records and it was in the promo CD bin (it was free.) I immediately liked the song, but wrote the band off as a "wanna-be Radiohead." Since then, I have learned that not only does Muse rock more and have a better live show, I just plain and simple like Muse better than Radiohead. The song "Sunburn" is the first song off the album "Showbiz" and it's a tough intro song to beat. Driving arpeggio piano with a slick bass line underneath ties this song together in a way that only Muse does these days. 9. Deadstar - This song isn't on any of their albums, yet it does have a music video... weird huh? It was released as a double A-side single with "In Your World" (similar to "Daytripper" and "We Can Work It Out" by the Beatles.) During the verses, listen to the guitar and bass. There is quite odd timing with when they choose to hit notes in between the pauses. The drums are right in sync with each and every awkward note that they've decided on. They make it sound so seemless when in fact this would be very difficult to perform live. While that type of thing impresses me, you may just like the song because it is damn near a pop/metal song. 7. Starlight - Another clap-a-long gem from the "Black Holes and Revalations" album, this song is basically dance/pop with a hard rock edge. The link is to a live performance at Abbey Road studios. While I'm not a fan of the karaoke lyrics in the corner, it definitely shows them in all of their trio-rocking glory. Now they do have somewhere in the neighborhood of 12-30 computer arranged MIDI tracks to back them up and fill out the sound, but it's impressive that only three people can produce this kind of orchestral rock. 6. Stockholm Syndrome - This song was supposedly inspired by System of a Down, and I can hear it a bit, but Muse blows those guys out of the water in a big way. This is another example of their pop/metal combination. The verses rock in a very dirty way while the chorus is etherial. The transistion between the two is flawless. I made sure to link to a live performance of this one! 5. Apocalypse Please - This song just gives me chills. If it's possible for a banging piano riff to be beautiful, this is the song that does it. Is it just me or does their bass player, Chris, look like Jeremy Piven in this video? 4. Futurism - This is a B-side that is now available on the "Origin of Symmetry" album on iTunes. They didn't originally include it on the album because of how difficult it is to play live. I almost wonder if they should dust it off now that they have many more years of touring under their belt because they riffs in this song are dirty. And I know I keep using "dirty" as the descriptor, but each one of their songs is like watching Tim Lincecum pitch when he's on top of his game. You just have to marvel at how wonderfully amazing the performance is. 3. Time Is Running Out - I have to include this song or fear a mutiny from most people. Arguably Muse's most popular song, it really is the reason I fully became a fan of them. One night I saw the video on MTV2 and the next day I owned the album. Then I all of a sudden, I owned all of Muse's catalog. It was that easy! 2. Knights of Cydonia - Very Queen-influenced jam. Oddly, I remember the first time I heard this song as well. I was driving from Davis to Sacramento to play at the Fox & Goose. The song premiered on the radio and blew me away. It was one of those times that your hear something that someone else produced and want to say, "I give up- I will never write/record/play anything that good, ever." After getting over the initial shell-shock, I realized that I don't have to sit in my bed for two years like Brian Wilson of the Beach Boys, just because Muse rocks the hell out of everything they do. I highly recommend checking this band out, or just getting stoked for their new album September 14th.